A touch switch is an electronic device that enables us to control a circuit by simply touching a sensor. Smart Kit 1005 is a very easy project to built and will make you the proud owner of a magic switch that will respond to the slightest touch of your hand on its sensitive plates. The circuit as you can see from its diagram is very simple and only uses 8 components. The heart of the circuit is the IC CD 4011 that is connected as a FLIP-FLOP. Pins 9 and 13 of the IC are the «SET» and «RESET» contacts of the FLIP-FLOP. The IC is of the CMOS type and requires a very low current to in its gates to control it. This high sensitivity of the circuit makes the touch operation possible. The two gates are held at logic state «1» continuously by means of the two resistors R1 and R3 that connect them to the positive supply rail. These resistors have a very large resistance of 10 Mohm. If we now touch a set of contacts the skin resistance closes the circuit between the corresponding gate and the negative supply rail. The skin resistance for small areas of the skin is normally much lower than 10 Mohm and the gate is effectively brought to logic condition «0» which makes the FLIP-FLOP change state. For any given state of the FLIP-FLOP touching the corresponding set of contacts will make the circuit to reverse its state of balance and in effect toggle the switch. 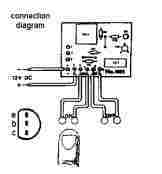 As a switch is used a relay driven by a transistor which is driven from the out put of the FLIP-FLOP. considerably and reduces the possibility of making errors. Smart Kit boards also come pre-drilled and with the outline of the components and their identification printed on the component side to make construction easier. To protect the board during storage from oxidation and assure it gets to you in perfect condition the copper is tinned during manufacturing and covered with a special varnish that protects it from getting oxidised and makes soldering easier. Soldering the components to the board is the only way to build your circuit and from the way you do it depends greatly your success or failure. This work is not very difficult and if you stick to a few rules you should have no problems. The soldering iron that you use must be light and its power should not exceed the 25 Watts. The tip should be fine and must be kept clean at all times. For this purpose come very handy specially made sponges that are kept wet and from time to time you can wipe the hot tip on them to remove all the residues that tend to accumulate on it. DO NOT file or sandpaper a dirty or worn out tip. If the tip cannot be cleaned, replace it. There are many different types of solder in the market and you should choose a good quality one that contains the necessary flux in its core, to assure a perfect joint every time. Clean the component leads with a small piece of emery paper. - Bend them at the correct distance from the component body and insert the component in its place on the board. You may find sometimes a component with heavier gauge leads than usual, that are too thick to enter in the holes of the p.c. board. In this case use a mini drill to enlarge the holes slightly. Do not make the holes too large as this is going to make soldering difficult afterwards. Take the hot iron and place its tip on the component lead while holding the end of the solder wire at the point where the lead emerges from the board. The iron tip must touch the lead slightly above the p.c. board. When the solder starts to melt and flow wait till it covers evenly the area around the hole and the flux boils and gets out from underneath the solder. The whole operation should not take more than 5 seconds. Remove the iron and let the solder to cool naturally without blowing on it or moving the component. If everything was done properly the surface of the joint must have a bright metallic finish and its edges should be smoothly ended on the component lead and the board track. If the solder looks dull, cracked, or has the shape of a blob then you have made a dry joint and you should remove the solder (with a pump, or a solder wick) and redo it. Take care not to overheat the tracks as it is very easy to lift them from the board and break them. When you are soldering a sensitive component it is good practice to hold the lead from the component side of the board with a pair of long-nose pliers to divert any heat that could possibly damage the component. Make sure that you do not use more solder than it is necessary as you are running the risk of short-circuiting adjacent tracks on the board, especially if they are very close together. - After having finished your work cut off the excess of the component leads and clean the board thoroughly with a suitable solvent to remove all flux residues that still remain on it. The switch only has eight components and its construction is very easy even for the most inexperienced. As usual construction must start from the least sensitive to heat components, which in this case are the IC socket and the pins. After soldering the pins and the socket, make the two jumper connections that are marked on the component side of the board, solder the relay in its place and continue with the transistor the diode and the LED. Once everything is in its place clean the board very well from flux residues and check it for short circuits and possible mistakes. handled with great care as it can be damaged very easily from static discharges. Avoid touching its pins and keep your body and the circuit board grounded during insertion. You should also take care not to bent any pins underneath the IC body during this operation. to connect any device you want to control with the touch switch but please remember that you should not exceed the power rating of the relay which is 250 V/2 A. Check your work for possible dry joints, bridges across adjacent tracks or soldering flux residues that usually cause problems. -Check again all the external connections to and from the circuit to see if there is a mistake there. See that there are no components missing or inserted in the wrong places. Make sure that all the polarised components have been soldered the right way round. Make sure the supply has the correct voltage and is connected the right way round to your circuit. Make sure that you have inserted the IC in its socket correctly and that you have not bent any pins during insertion. Check your project for faulty or damaged components. Tough switch electronic circuit. Security and other sensors and detectors electronic circuits and schematics.